Groups are an easy way of collaborating with students and teachers who are involved in a common activity. Every group should have a teacher supervising the group. This article gives detailed instructions on how to add and delete members in a group. Membership in a group can be composed of any combination of students, parents, teachers, and administrators. Individuals from outside the school community can be given an Associate account in School Loop; a role with Group privileges but no access to student information, so they, too, can participate in Groups as necessary. Each group's membership is also listed in a sortable table. Removing members is easier than before. Take note of the View Former Members link on the right. Follow the on-screen directions to either add new or remove existing members. 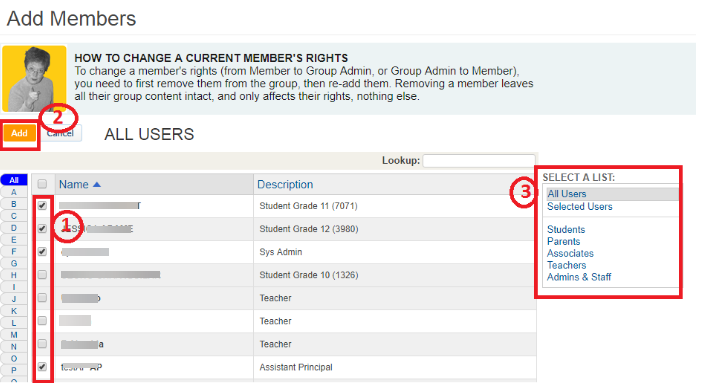 You may select members from among the registered users of your School Loop site. To add members from different lists (e.g. Teachers and Staff), click on the names you wish to add from one list, select a different list (right), check more names, and then click the Add button. The system will remember all the boxes you've checked. 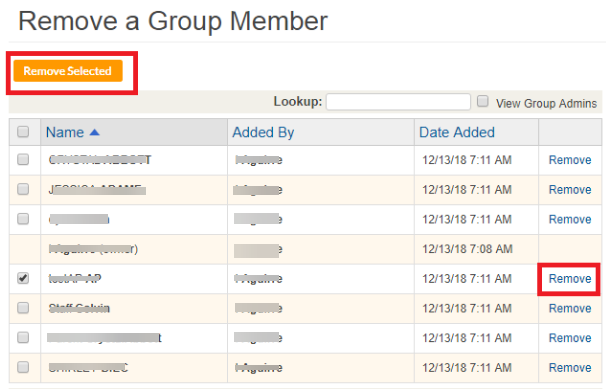 In order to remove a member from the group, select the Remove members option from the toolbox and select the member to be removed and select Remove or click the Remove link next to the member's name.